Do you want to help a team, an organization, a school, or an entire community to create positive changes that enable people to flourish? Do you need to grow strong, trusted connections between people to help them confidently self-organize and make a positive difference for others? Are you longing to do this quickly, effectively and joyfully so people are motivated and committed to making things happen? Appreciative Inquiry (AI) Summits are a powerful way to quickly create safe spaces that gather people together to ask appreciative, possibility-orientated questions, tap into their individual and collective strengths, co-create shared dreams of the future, build collaborative pathways to move forward, and secure commitment to action. Rather than focusing on what’s wrong with a system, AI Summits build on a system’s strengths to improve relationships, heighten creativity, and achieve its desired goals. 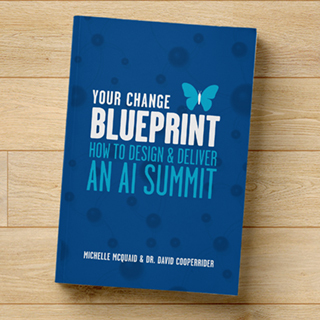 Your Change Blueprint distils three decades of research findings on complex Adaptive Systems, Appreciative Inquiry (AI), Neuroscience and Positive Psychology and reveals practical ways to create positive disruptions that enable people and systems to flourish. This book provides a step-by-step review of how AI Summits can be used to bring together hundreds of people to simultaneously change the way people think, feel and act. Determine if an AI Summit is the right approach to create a positive disruption in your system. Leverage the best-practice 6D model that has been used by AI Summits around the world to deliver transformational changes. Embed the evidence-based 12 magic mechanisms that enable an AI Summit to create long-term neurological, psychological, social and systemic changes that support individual and collective flourishing. 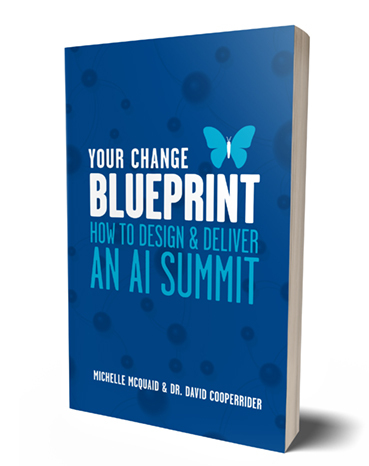 Featuring AI Summit case studies from around the world, this book also includes detailed examples of how systems successfully design pre-Summit resources, deliver AI Summit events and ensure post-Summit results, so you have everything you need to do the same for the systems you support.